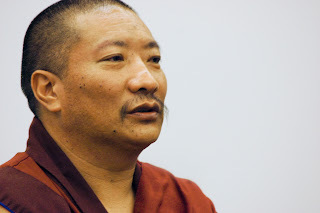 Drupon Thinley Nyingpo Rinpoche will be visiting The Florida Drikung Dzogchen Community 13-16 February. He will be offering teachings on the Great Drikung Phowa-- Drikung Phowa Chenmo-- known as the jag tshug ma or The Standing Blade of Grass. While phowa is one of the Six Yogas of Naropa, the precious pith tantric instructions of the Dhakpo Kagyu lineages, there are many special phowa instructions in the tantric teachings of the Nyingma and Sarma lineages. The jag tshug ma is a terma teaching of Guru Padmasambhava, and has been practiced in the Drikung Kagyu lineage in an unbroken lineage until the present. Phowa practice allows one to transfer one's consciousness to Dewachen, the pure land of Buddha Amitabha at death. It is a powerful practice that is considered an essential part of vajrayana practice, and is a practice that is entirely appropriate for practitioners of all levels of experience. Please let us know if you need a phowa text.